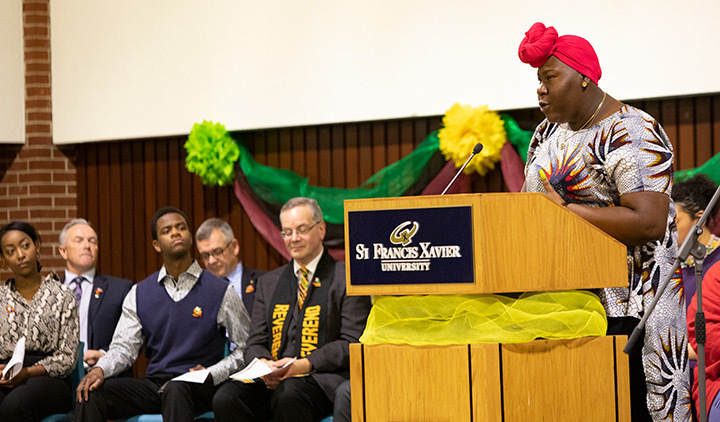 “We gather to honour and celebrate the many achievements that African Nova Scotians have made to our society,” said co-emcee Kelsey Jones, StFX African Descent Student Affairs Coordinator, who hosted the ceremony with Lorraine Reddick, Student Support Worker with the Strait Regional Centre for Education (SRCE). African Heritage Month marks a time of reflection, but more importantly, a time for education, she said. The month gives attention to a history that’s far too often exploited by the mainstream narrative. “Our history is your history,” Ms. Jones said, repeating this year’s theme as she encouraged everyone to listen and to learn, to attend events, and to listen to voices, not just during this month, but throughout the entire year. 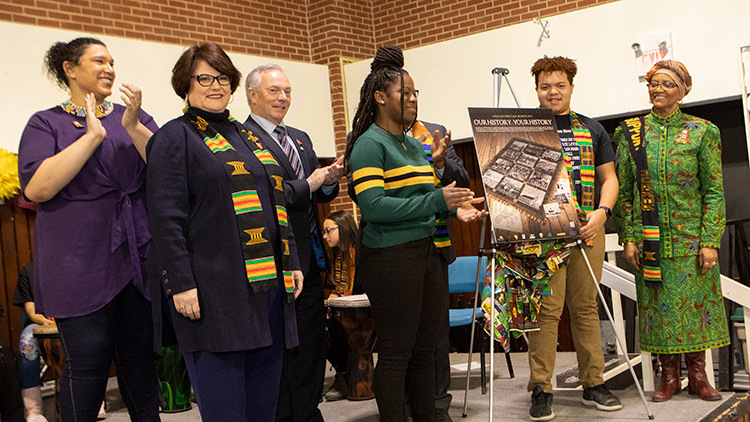 In a special part of the ceremony, and an historic first, she said today marks the first time the Pan African flag will be flown on campus for the entirety of African Heritage Month. The Pan African flag was raised at both the Antigonish Town Hall and in front of the President’s Office on the StFX campus. Another special moment came in a tribute and a moment of silence for the late Dr. Agnes Calliste, retired StFX sociology professor, national and international celebrated academic, and community champion who tirelessly served the Xaverian and Nova Scotian communities, including as StFX’s Black Student Advisor. Dr. Calliste passed away in August 2018. Minister Ince said this is an important time, a time to learn something different and unique. “African Heritage Month is a time to celebrate and share the culture, history, and achievements of African Nova Scotians,” he said. It’s a time to recognize the distinct story of African Nova Scotians and how this story is interwoven in our province’s past, present and future, he said. Understanding and celebrating this diversity was a message shared by a number of speakers. 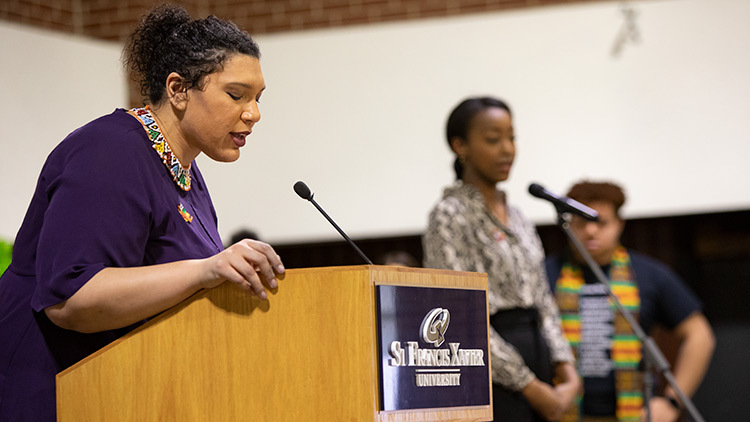 “We’re thrilled to be hosting the ceremony at StFX, and the long overdue flying of the Pan African flag on campus,” said Andrew Beckett, StFX Vice-President Finance & Administration. Mr. Beckett said it speaks to the importance of diversity, and the richness it adds. While he noted that StFX has much more to do, he said the university is pleased to be embracing and building on this diversity, in past efforts and in the recent opening of the Diversity Education Centre on campus, designed to help celebrate and create more of a focus. Both Antigonish County Warden Owen McCarron and Antigonish town councilor Mary Farrell spoke of how the month celebrates the culture, legacy and achievements of African Nova Scotians, while sharing how this story is interwoven. “When we all acknowledge our shared history, we will be able to facilitate positive change,” Mr. McCarron said. 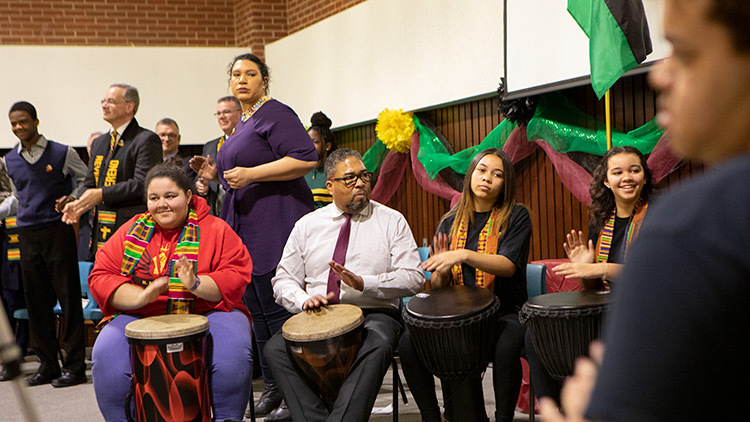 As part of the ceremony, SRCE teacher and StFX alumnus Morgan Gero led an African Drumming performance with students from St. Andrew Junior School and Dr. John Hugh Gillis Regional High School. Minister Ince, an accomplished drummer himself, joined in the closing performance. Several classes from St. Andrew’s Consolidated School and the Antigonish Education Centre attended the event. Others speaking at the ceremony included Paul Landry, SRCE, and Rev. Peter Smith, who offered a prayer. Remarks were also read from the Hon. Randy Delorey, MLA, and Sean Fraser, MP, who were unable to be in attendance. Naomi Ogbogbo presented her poem entitled "Royalty." The event is hosted by the Town of Antigonish, Zone #7 African Cultural Awareness Association, African Nova Scotia Affairs, Support 4 Culture, the County of Antigonish, Black Educators Association of Nova Scotia, SRCE, and StFX.